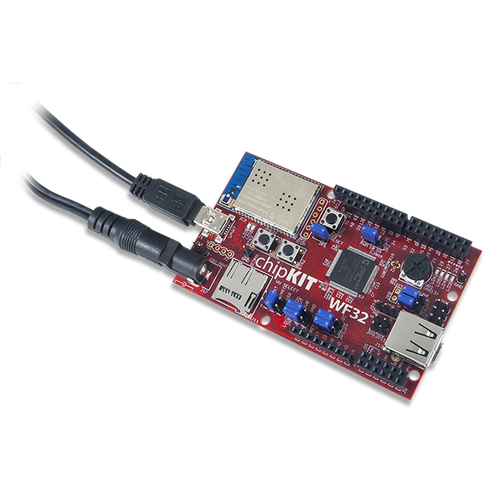 The WF32 board is designed to be used with the Multi-Platform IDE (MPIDE), the MPIDE development platform was created by modifying the Arduino IDE. It is backwards-compatible with the Arduino IDE. Links for where to obtain the MPIDE installation files and instructions for installing MPIDE can be found at www.chipkit.net/started. The MPIDE uses a serial communications port to communicate with a boot loader running on the WF32 board. The serial port on the WF32 board is implemented using an FTDI FT232RQ USB serial converter. Before attempting to use the MPIDE to communicate with the WF32, the appropriate USB device driver must be installed. The WF32 board uses a standard mini-USB connector. Generally, a USB A to mini-B cable is used for connection to a USB port on the PC. When the MPIDE needs to communicate with the WF32 board, the board is reset and starts running the boot loader. The MPIDE then establishes communications with the boot loader and uploads the program to the board. When the MPIDE opens the serial communications connection on the PC, the DTR pin on the FT232RQ chip is driven low. This pin is coupled through a capacitor to the MCLR pin on the PIC32 microcontroller. Driving the MCLR line low resets the microcontroller, which restarts the execution with the boot loader. This automatic reset action (when the serial communications connection is opened) can be disabled. To disable this operation, there is a jumper labeled JP1, which can be disconnected. JP1 is normally shorted, but if the shorting block is removed, the automatic reset operation will be disabled. Two red LEDs (LD1 and LD2) will blink when data is being sent or received between the WF32 and the PC over the serial connection. The header connector J2 provides access to the other serial handshaking signals provided by the FT232RQ. Connector J2 is not loaded at the factory and can be installed by the user to access these signals. The WF32 is designed to be powered via USB (J1), from an external power supply (J14 or J17), or from the USB OTG receptacle (J12). Jumper block J15 is used to select which power supply is used. The power supply voltage selected by J15 is applied to the unregulated power bus, VU. In order to operate the WF32 as a USB device powered from the USB serial interface, connector J1, place a shorting block in the UART position of jumper block J15. To operate the WF32 from an external power supply,attach the power supply to either J14 or J17 and place a shorting block in the EXT position of J15. Be sure to observe correct polarity when connecting a power supply to J14, as a reversed connection could damage the board. To operate the WF32 as a USB powered device from the USB OTG connector (J12) place a shorting block on the USB position of J15. This will normally only be done when running a sketch on the board that programs it to operate as a USB device. The power supply section in the WF32 provides two voltage regulators, a 3.3V regulator and a 5V regulator. All systems on the WF32 board itself operate at 3.3V and are powered by the 3.3V regulator. The 5V regulator is used to provide power for external circuits, such as shields, that require 5V for operation. The 5V regulator can be completely disabled if it is not needed for a given application. The WF32 board is designed for low power operation and efficient use of battery power, as such a switch mode voltage regulator is used for the 3.3V power supply. This switch mode regulator is made up of a Microchip MCP16301 and associated circuitry. It can operate on input voltages from 4V to 30V with up to 96% efficiency, and is rated for 600mA total current output. The MCP16301 has internal short circuit protection and thermal protection. The 3.3V regulator takes its input from the unregulated power bus, VU, and produces its output on the VCC3V3 power bus. The VCC3V3 bus provides power to all on-board systems and is available at the shield power connector (J3) to provide 3.3V power to external circuitry, such as shields. The 5V regulator section provides a low dropout linear regulator. No circuitry on the WF32 board uses the 5V supply. It is provided for powering external circuitry that needs a 5V power supply. This voltage regulator uses an On Semiconductor NCP1117LP. The NCP1117LP is rated for an output current of 1A. The dropout voltage of the NCP1117LP is a maximum of 1.4V at 1A output current. The maximum input voltage of the NCP1117LP is 18V. The recommended maximum operating voltage is 15V. The input voltage to the 5V regulator section is taken from the VU bus, and the output is placed on the VCC5V0 power bus. There is a reverse polarity protection diode in the external power supply circuit. Considering the diode drop plus the forward drop across the regulator, the minimum input voltage to the regulator should be 7V to produce a reliable 5V output. For input voltages above 9V, the regulator will get extremely hot when drawing high currents. The NCP1117LP has output short circuit protection and internal thermal protection and will shut down automatically to prevent damage. External 5V regulator used to regulate VU and provide 5V power. LDO In is the input to the on-board linear regulator. VU is the unregulated input voltage selected by the jumper setting jumper block J15. 5V0 is the connection to the VCC5V0 power bus on the WF32 board. EN Ext is a signal provided to enable an external voltage regulator if one is being used. This would allow the sketch running on the WF32 to turn on/off the external voltage regulator. When used with an external voltage regulator, this allows the board to go into an extremely low power operating mode. This signal is connected to Port D, bit 13 (RD13) on the PIC32 microcontroller. This is accessible using digital pin 64. GND is a connection to the digital ground bus on the WF32 board. To completely disable operation of the on-board linear regulator, remove all shorting blocks from J16. Note: In this case, when J15 is in the EXT position, and J16 is jumpered to regulate the external input, do not apply more than 18V. This can destroy the 5.0V regulator. An external 5V regulator can be used. This would be desirable, for example, when operating from batteries. An external switch mode 5V regulator could be used to provide higher power efficiency than the on-board linear regulator. In this case, use wires as appropriate to connect VU to the unregulated input of the external regulator. Connect the regulated 5V output to 5V0. Connect GND to the ground connection of the external regulator. Optionally, connect EN Ext to the enable input control of the external regulator, if available. This allows the external regulator to be turned off for low power operation. Digital pin 64 is then used to turn on/off the external regulator. The PIC32MX695 microcontroller is rated to use a maximum of 98mA of current when operating at 80 MHz. The MRF24WG0MA WiFi module typically consumes a maximum of 237mA when transmitting. This allows approximately 265mA of current to power the remaining 3.3V circuitry on the WF32 board and external circuitry powered from the VCC3V3 bus. No circuitry on the WF32 board is powered from the VCC5V0 power bus, leaving all current available from the 5V regulator to power external circuitry. IOREF (pin 2): This pin is tied to the VCC3V3 bus. P32_RST (pin 3): This connects to the MCLR pin on the PIC32 microcontroller and can be used to reset the PIC32. VCC3V3 (pin 4): This routes the 3.3V power bus to shields. VCC5V0 (pin 5): This routes the 5V power bus to shields. GND (pin 6, 7): This provides a common ground connection between the WF32 and the shields. This common ground is also accessible on connectors J4 and J5. VEXT (pin 8): This connects to the voltage provided at the external power supply connectors (J14 and J17). This can be used to provide unregulated input power to the shield. It can also be used to power the WF32 board from the shield instead of from the external power connector. The PIC32 microcontroller operates at 3.3V. The original Arduino boards operate at 5V, as do many Arduino shields. There are two issues to consider when dealing with 5V compatibility for 3.3V logic. The first is protection of 3.3V inputs from damage caused by 5V signals. The second is whether the 3.3V output is high enough to be recognized as a logic high value by a 5V input. The digital I/O pins on the PIC32 microcontroller are 5V tolerant. The analog capable I/O pins are not 5V tolerant. To provide 5V tolerance on those pins, the WF32 contains clamp diodes and current limiting resistors to protect them from 5V input voltages. The fact that all I/O pins are 5V tolerant means that it is safe to apply 5V logic levels to any pins on the board without risk of damaging the PIC32 microcontroller. The minimum high-voltage output of the PIC32 microcontroller is rated at 2.4V when sourcing 12mA of current. When driving a high impedance input (typical of CMOS logic) the output high voltage will be close to 3.3V. Some 5V devices will recognize this voltage as a logic high input, and some won’t. Many 5V logic devices will work reliably with 3.3V inputs. The WF32 board provides 43 of the I/O pins from the PIC32 microcontroller at pins on the input/output connectors J6, J7, J8, J9, and J10. The PIC32 microcontroller can source or sink a maximum of 25mA on all digital I/O pins. However, to keep the output voltage within the specified output voltage range (VOL 0.4V, VOH 2.4V) the pin current must be restricted to +7/-12mA. The maximum current that can be sourced or sunk across all I/O pins simultaneously is +/-200mA. The maximum voltage that can be applied to any I/O pin is 5.5V although not all pins are 5V tolerant. For more detailed specifications, refer to the PIC32MX5XX/6XX/7XX Data Sheet available from www.microchip.com. Note that the series resistors that are part of the voltage clamp circuit to provide 5V tolerance on the analog capable I/O pins, limiting the current that can be sourced or sunk by those pins. These resistors add 200 ohms of resistance to the input/output circuit and limit the effective drive current to about 1mA-2mA source/sink capability on the analog capable pins. Connectors J7 and J9 are 2×8 female pin header connectors that provide digital I/O signals. The outer row of pins (closer to the board edge) corresponds to the I/O connector pins on an Arduino Uno or Duemilanove board. The inner row of pins provides access to the extra I/O signals provided by the PIC32 microcontroller. Connector J8 is a 2×6 female pin header connector that provides access to the analog input pins on the microcontroller. The outer row of pins corresponds to the six analog pins on an Arduino Uno or Duemilanove. The inner row of pins is for the additional I/O signals provided by the PIC32 microcontroller. The analog pins on J8 can also be used as digital I/O pins. The chipKIT/Arduino system uses logical pin numbers to identify digital I/O pins on the connectors. The logical pin numbers for the I/O pins on the WF32 are 0-48. These pin numbers are labeled in the silk screen on the board. Pin numbers 0-13 are the outer row of pins on J9 and J7, from right to left. Pin numbers 14-19 are the outer row of pins on J8 from left to right. Pins 20-25 are the inner row of pins on J8 from left to right. Pin numbers 26-41 are the inner row of pins on J9 and J7 from right to left. Pin 42 is the pin labeled A on J7. This pin is normally the reference voltage for the microcontroller’s A/D converter, but can also be used as a digital I/O pin. The analog inputs on connector J8 are assigned pin numbers. The outer row of pins on J8 is analog inputs A0-A5. The inner row of pins is A6-A11. These pins are also assigned digital pin numbers; A0-A5 are digital pins 14-19, and A6-A11 are 20-25. 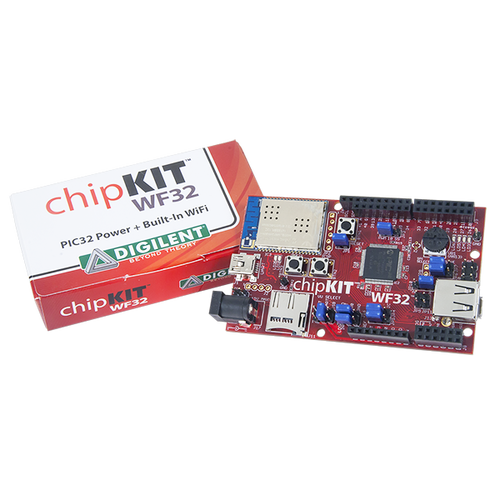 The 802.11b/g compatible WiFi interface on the WF32 is provided by a Microchip MRF24WG0MA WiFi module. This module provides the radio transceiver, antenna, and 802.11 compatible network firmware. The MRF24WG0MA firmware provides the 802.11 network protocol software support. The DNETcK and DWIFIcK libraries provide the TCP/IP network protocol support that works with the 802.11 protocol support provided by the WiFi module. The primary communications interface with the MRF24WG0MA WiFi module is a 4 wire SPI bus. This SPI bus uses SPI4 in the PIC32 microcontroller, and this SPI controller is dedicated to use for communications with the WiFi module. The WiFi module supports SPI clock speeds up to 25MHz. In addition to the SPI interface, the interface to the WiFi module also includes a reset signal, an interrupt signal and a hibernate signal. The active low RESET signal is used to reset the WiFi module The external interrupt signal, INT, is used by the module to signal to the host microcontroller that it needs servicing by the microcontroller software. The INT signal on the WiFi module is connected to external interrupt INT4 on the PIC32 microcontroller. The active low HIBERNATE signal is used to power the WiFi module down and put it into a low power state. The interface signals to the WiFi module are controlled by the network libraries and are not normally accessed by the user sketch. Refer to the schematic for the WF32 board for details on these connections. More detailed information about the operation of the MRF24WG0MA can be obtained from the manufacturer data sheet available from www.microchip.com. 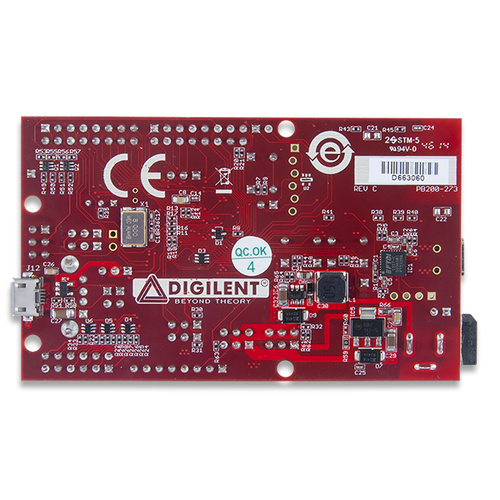 The WiFi module on the WF32 is intended for use with the Digilent network libraries DNETcK and DWIFIcK. The DNETcK library provides TCP/IP protocol support for all compatible network interfaces supported by Digilent products, including the WF32. The DWIFIcK library provides the additional library support required for connecting to and operating with the Microchip MRF24WG0MA wireless network modules. The Digilent network libraries are available here. These libraries make use of a custom version of the Microchip Application Library. It is necessary to accept the Microchip Application Library license agreement before downloading the library. There are reference examples demonstrating the use of these libraries in the library download. There are more extensive examples available on the Digilent web site as well. USB full speed host and device support. Endpoint buffering anywhere in system RAM. Integrated DMA to access system RAM and Flash memory. Connector J13 on the top right side of the board is a standard USB type A receptacle. This connector will be used when the WF32 has been programmed to operate as a USB embedded host. The USB device is connected either directly to the WF32, or via cable to this connector. Connector J12, on the bottom right side of the board is the Device/OTG connector. This is a standard USB micro-AB connector. Connect a cable with a micro-A plug (optionally available from Digilent) from this connector to an available USB port on a PC or USB hub for device operation. The USB specification allows for two types of devices with regard to how they are powered: self-powered devices and bus powered devices. A self-powered device is one that is powered from a separate power supply and does not draw power from the USB bus. A bus powered device is one that draws power from the USB bus and does not have a separate power supply. The WF32 can be operated as a self-powered device or as a bus powered device from either the USB serial connector (J1) or the USB OTG/device connector (J12). As described in the power supply section above, jumper block (J15) is used to select the power source to be used to power the board. For operation as a self-powered device, place a shorting block on the EXT position of J15 and connect a suitable external power supply to either J14 or J17. To operate the WF32 as a bus powered device powered from the USB serial connector (J1), place a shorting block in the UART position of J15. To operate as a bus powered device powered from the OTG/device connector (J12), place a shorting block in the USB position of J15. Note that there are two completely independent USB interfaces on the WF32 board, and it is possible for the WF32 to appear as two different USB devices at the same time. These two devices can be connected to two different USB ports on the same host, or to USB ports on two different hosts. If the WF32 board is connected to two different USB hosts simultaneously, there will be a common ground connection between these two hosts through the WF32 board. In this case, it is possible for ground current to flow through the WF32 board, possibly damaging one or the other USB host if they do not share a common earth ground connection. When the WF32 is operating as a bus powered device using USB connector J1, it will appear as a self-powered device from the perspective of a USB host connected to J12. Similarly when operating as a bus powered device from connector J12, it will appear as a self-powered device from the perspective of connector J1. A USB host is expected to be able to provide bus power to USB devices connected to it. Therefore, when operating as a USB host, the WF32 should normally be externally powered. Connect a power supply to the external power connector, J17. It is possible to operate the WF32 as a USB host powered from USB connector J1, however in this case, the host USB port will be providing power for the WF32 as well as the USB device connected to the WF32. In this case, ensure that the total load does not exceed the 500mA maximum load that a USB device is allowed to present to the host. The USB host provides regulated 5V power to the connected USB device. The internal 5V LDO regulator can be used to provide the USB power when operating from an external power supply. Place shorting blocks on jumper block J16 as described above in the power supply section. If the external power supply being used is a regulated 5V supply, place a shorting block between pins VU and 5V0 on connector J16 as described above in the power supply section. The power supply used must be able to supply enough current to power both the WF32, and the attached USB device, since the WF32 provides power to the attached USB device when operating as a host. The USB 2.0 specification requires that the host provide at least 100mA to the device. Jumper JP10 is used to route power to the host connector being used. Place the shorting block in the “A” position when using the standard USB type A (host) Connector (J13). Place the shorting block in the “AB” position for use with the USB micro-AB (OTG) connector (J12). When operating as a USB host, the PIC32MX695 microcontroller controls application of power to the connected device via the VBUSON control pin (labeled VBUSON in the schematic). Bus power is applied to the USB bus by driving the VBUSON pin high. Power is removed from the bus by driving the VBUSON pin low. The VBUSON pin is accessed via bit 3 of the U1OTGCON register. The VBUSON signal is shared with same microcontroller pin as analog input A. When operating as a USB host, this pin is not available as an analog input or general purpose I/O pin. The VBUSON pin drives the enable input of a TPS2051B Current-Limited Power Distribution Switch to control the application of USB power to the host connector. This switch has over-current detection capability and provides an over-current fault indication by pulling the signal USBOC low. The over-current output pin can be monitored via the INT3/RA14 pin on the PIC32MX695 microcontroller. This signal appears on connector J7, pin 1 on the board, and is digital pin 8. Details about the operation of the TPS2051B can be obtained from the data sheet available at www.ti.com. Both the VBUSON and the INT3/RA14 signals connect to the TPS2051B through jumpers JP11, and JP9, respectively. When operating as a USB host, both jumpers should be shorted with shorting blocks. Pin A7 will be unusable as an analog input and will be driven as an output. To monitor the over-current output pin of the TPS2051B, us the attachInterrupt() function to set INT3/RA14 (pin 8) as an external interrupt. The PIC32 USB controller can be accessed using the USB libraries for use within the MPIDE environment. 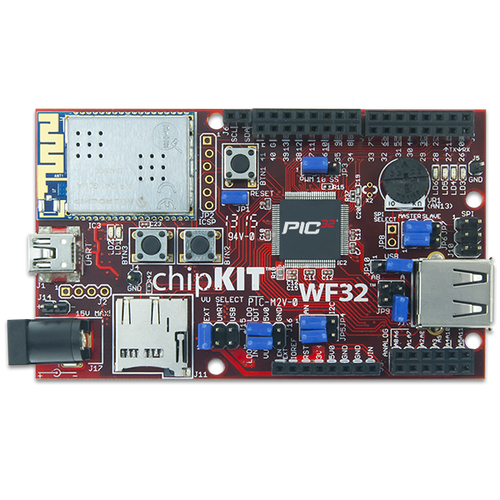 When using the WF32 outside the MPIDE environment, the Microchip Application Library provides USB stack code that can be used with the board. There are reference designs available on the Microchip web site demonstrating both device and host operation of PIC32 microcontrollers. These reference designs are suitable to use for developing USB firmware for the WF32 Shield. The microSD card connector provides the ability to access data stored on micro-SD sized flash memory cards using the SD card library provided as part of the MPIDE software system. The SD card is accessed using an SPI interface on PIC32 microcontroller pins dedicated to this purpose. The SD library uses a 'bit-banged' software SPI implementation to talk to SD cards. On the WF32 board, the I/O pins used to communicate with the SD card are dedicated to that function and not shared with other uses. UART 1: Asynchronous serial port. Pin 0 (RX), Pin 1 (TX). This is accessed using the runtime object: Serial. These pins are connected to I/O connector J9 and are also connected to the FT232RQ USB serial converter. It is possible to use these pins to connect to an external serial device when not using the USB serial interface. This uses UART1 (U1RX, U1TX) on the PIC32 microcontroller. UART 4: Asynchronous serial port. Pin 39 (RX), Pin 40 (TX). This is accessed using the runtime object: Serial1. This uses UART4 (U24X, U4TX) on the PIC32 microcontroller. Synchronous serial port. Pin 10 (SS), Pin 11 (MOSI), Pin 12 (MISO), Pin 13 (SCK).This can be accessed using the SPI standard library. It can also be accessed using the DSPI0 object from the DSPI standard library. This uses SPI2 (SS2, SDI2, SDO2, SCK2) on the PIC32 microcontroller. These signals also appear on connector J10. Jumpers JP6 and JP7 are used to select whether the WF32 operates as a Master (transmit on MOSI, receive on MISO) or a Slave (transmit on MISO, receive on MOSI) device. The shorting blocks on JP6 and JP7 are normally placed in the Master position for the WF32 to function as an SPI master. Jumper JP3 is used to select PWM output or the SPI SS function on Pin 10. The shorting block on JP3 should be in the PWM position to select PWM output. It should be in the SS position to select the SPI SS function. JP4 will normally be in the PWM position. In general, the only time it needs to be in the SS position is when the WF32 board is being used as an SPI slave device. SPI1: Synchronous serial port. This is an additional SPI interface on the PIC32 microcontroller that can be assessed using the DSPI1 object from the DSPI standard library. It is not accessible using the SPI standard library. Several of the SPI1 signals are shared in various ways with other peripheral functions. SS1 is connected to connector J9, pin 15, the connector location for digital pin 7, via a 1K ohm resistor. This signal is accessed via digital pin number 71. SDO1 is accessed via digital pin 3. This conflicts with one of the PWM outputs accessed using analogWrite(). SDI1 is accessed via digital pin 38. SCK1 is connected to connector J7, pin 1, the connector location for digital pin 8, via a 1K ohm resistor. This conflicts with external interrupt INT3. This signal can be accessed via digital pin number 72. SPI3: Synchronous serial port. This is an additional SPI interface on the PIC32 microcontroller that can be accessed using the DSPI2 object from the DSPI standard library. It is not accessible using the SPI standard library. Pin 39 (SS3), pin 1 (SDO3), pin 0 (SDI1), and pin 40 (SCK3). Note that pins 0 and 1 conflict with UART1: object class Serial. Pins 39 and 40 conflict with UART4: Serial1 object class. SPI4: Synchronous serial port. This port is dedicated for access to the MR24WG0MA WiFi module and is normally only used by the networking libraries. This can be accessed using the DSPI3 object class from the DSPI standard library, but this is not recommended for normal operation of the board. Synchronous serial interface. The PIC32 microcontroller shares analog pins A4 and A5 with the two I2C signals SDA and SCL. Jumpers JP4 and JP5 are used to select whether the analog pin functions or the I2C pin functions are being used. The shorting blocks are placed in the AN position to select the analog input function or general digital I/O. They are placed in the I2C position to use the pins for I2C operation. This uses I2C2 (SDA2, SCL2) on the PIC32 microcontroller. Both SDA2 and SCL2 are accessible on connector J6. Pulse width modulated output; Pins 3 (OC1), 5 (OC2), 6 (OC3), 9 (OC4), and 10 (OC5). These can be accessed using the analogWrite() runtime function. Pin 3 (INT0), Pin 2 (INT1), Pin 7 (INT2), Pin 8 (INT3), Pin 57 (INT4). Note that the pin numbers for INT0 and INT4 are different than on some other boards. INT4 is dedicated for use with the MRF24WG0MA WiFi module and is not brought out to a connector pin. Pin 13 (LD6), Pin 43 (LD5), Pin 48 (LD4), Pin 47 (LD3). Pin 13 is shared between a connector pin and the LED. Pin 43, 48, and 47 only goes to the LED and not to any connector pin. Driving the pin HIGH turns the LED on, driving it LOW turns it off. There are two push button switches labeled BTN2 (pin 65), and BTN3 (pin 66). The digitalRead() function will return LOW if the button is not pressed and HIGH when the button is pressed. Labeled A, the left-most outer pin on connector J5. This is used to provide an external voltage reference to determine the input voltage range of the analog pins. The maximum voltage that can be applied to this pin is 3.3V. This pin can also be used as digital pin 42. A potentiometer (pot) is provided on the board to be used as an analog signal source or analog control input. The pot is a 10Kohm trimmer pot connected between the VCC3V3 supply and ground. The wiper of the pot is connected to analog input A13. The pot is read using the analogRead() function. Real Time Clock Calendar. The PIC32 microcontroller contains an RTCC circuit that can be used to maintain time and date information. The operation of the RTCC requires a 32.768Khz frequency source. Crystal X2 (not loaded), just above and to the right of the PIC32 microcontroller IC, is provided for you to solder a 32Khz watch crystal. The Citizen CFS206-32.768KDZF-UB crystal can be used in this location. The PIC32 microcontroller is reset by bringing its MCLR pin low. The MCLR pin is connected to the P32_RST net on the circuit board. As described earlier, reset of the PIC32 microcontroller can be initiated by the USB serial converter. The USB serial converter brings the DTR pin low to reset the microcontroller. Jumper JP1 can be used to enable/disable the ability for the USB serial converter to initiate a reset. The P32_RST net is connected to pin 3 of connector J3. This allows circuitry on a shield to reset the microcontroller, or to ensure that the circuitry on the shield is reset at the same time as the microcontroller. Connector J10 provides access to the SPI bus. Pin 5 provides access to the SPI Slave Select signal (SS). On Arduino boards, the corresponding connector is also used as an in-system programming connector as well as providing access to some of the SPI signals. On Arduino boards, pin 5 of this connector is connected to the reset net. Some Arduino shields, most notably the Ethernet shield, connect pin 5 to the reset net on pin 3 of connector J3. This causes the processor to be reset each time an attempt is made to access the SPI port. Jumper JP8 can be used to break the connection between J10 pin 5 and reset when using Arduino shields that make this connection. JP8 has a cut-able trace on the top of the board that can be cut to break the connection between SPI SS and reset. JP8 is not loaded at the factory. To restore the connection, solder a two pin header at the JP8 position and install a shorting block. A reset button is located to the right of the MRF24WG0MA WiFi module. Pressing this button resets the PIC32 microcontroller. 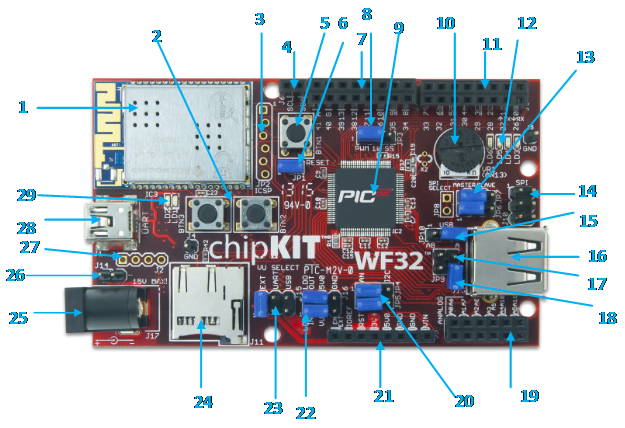 In addition to being used with the MPIDE, the WF32 board can be used as a more traditional microcontroller development board using Microchip Development Tools. Unloaded connector JP2 on the right side of the MRF24WG0MA WiFi module is used to connect to a Microchip development tool, such as the PICkit™3. The holes for JP2 are staggered so that a standard 100-mil spaced 6-pin header can fit to the board without the need to solder it in place. Any Microchip development tool that supports the PIC32 microcontroller family, and that can be connected via the same 6-pin ICSP interface as the PICkit™3, can be used. Typically, a standard male connector and a 6-pin cable is used with JP2 so that a PICkit™3 can be attached to the WF32 board. 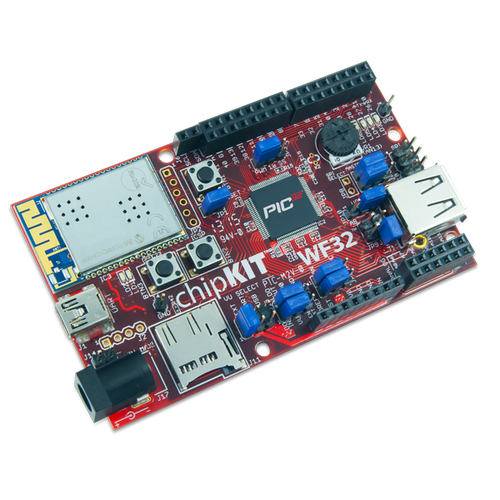 The chipKIT PGM can also be used in place of a PICkit3 to program the WF32 with the Microchip Development tools. The chipKIT PGM has a smaller form factor and does not need a 6-pin cable to connect to JP2. The Microchip MPLAB® IDE or the MPLAB® X IDE can be used to program and debug code running on the WF32 board. These programs can be downloaded from the Microchip web site. Using the Microchip development tools to program the WF32 board will cause the boot loader to be erased. To use the board with the MPIDE again, it is necessary to program the boot loader back onto the board. The boot loader source code and compiled image can be found at www.chipKIT.net. The following tables show the relationship between the digital pin numbers, the connector pin numbers and the microcontroller pin numbers. In the following tables, columns labeled pin # refer to the digital pin number. This is the value that is passed to the pinMode(), digitalRead(), digitalWrite() and other functions to refer to the pin. For most pins, this pin number will agree with the pin number labeled on the board. For the pins whose function can be switched using jumpers, the pin number labeled on the board is correct when the jumper is in the “normal” position. alternate position for JP3 is the SS position. The digital pin number for the microcontroller signal SS is 44. With JP3 in the SS position, digital pin 44 is connected to the pin labeled 10 on the board, and digital pin 10 is not connected. The pin labeled 10 on the board is connected to connector J7 pin 5. This is shown as J5-05 in the following tables. In the 'Pinout Table by Shield Connector Pin' table below, J5-05 is shown has being either pin # 10 or 44. J5-04 is connected to pin # 10 when JP3 is in the PWM position and is connected to pin # 44 when in the SS position.